One of the first rules a young journalist must learn in the newsroom is often the hardest pill for them to swallow: good ones never betray the principles of their profession. As a fresh face in college quietly observing the rationale of reporters throughout history in classroom case studies, I was silently baffled by the moral gray areas they routinely danced on to get a story, even apart from their dichotomous reasoning (whether it be for information or sensationalism). That risk-takers could equally produce both great correspondents as well as tabloid vultures wasn’t an uncommon phenomenon, but the stigma of the latter certainly helped to undermine the reputation of genuine newspaper sleuths, whose work on the field could often be met by the suspicion of partial truths and lurid exaggerations. Part of that thought process worms its way into the fabric of Tom McCarthy’s “Spotlight” at various intervals, and yet the obstacles these reporters face are valid concerns: there is a shocking story to tell, but many of those targeted have waited too long for some semblance of justice to assume that the media is willing to publish unfiltered versions of their stories. An early scene offers emphasis of this scenario with internal sentience. The year is 2001, and as The Boston Globe is caught in the trenches of declining readership, it falls into the grasp of a mild-mannered editor-in-chief named Marty Baron (Liev Schreiber), who wants to make the paper “essential” again to the community. He conducts meetings with prominent members of staff in a manner that implies stoic resignation of their shaky observations. He asks what the follow-up is to a recent editorial about a molestation case in the Catholic Church. An editor chimes in arrogantly: “it’s a column, there is no follow-up.” Ah, but there are details that have emerged in the wake of that piece suggesting some ominous things – namely, that a prominent Cardinal in the Boston archdiocese knew of such allegations long before the recent ones, and did nothing to remove the accused priest from the local parish. Who would not see these details as worthy of investigation? The dialogue of the moment highlights the complacence of those at the helm: “it’s a classic case of he said, she said.” Marty’s insistence lands the story into the hands of the paper’s most cognizant reporters, but not before the movie has regarded the team from a space of frustration; these are journalists who are too caught up in the momentum of the surface of things, and it has affected the pace of their judgment. 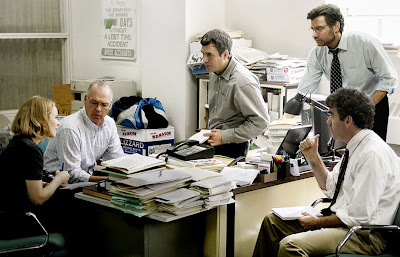 The “Spotlight” team, consisting of four members of the Globe charged with investigative reporting on subjects that require lengthy correspondence, quickly descend into the fray. While the operation is spearheaded by Walter Robinson (Michael Keaton), a seasoned veteran of the Globe with firm conviction, his three reporters bring with them a balance of audacity, discipline and empathy: Mike Rezendes (Mark Ruffalo), who fearlessly wanders into the office of a disgruntled defense attorney to push the boundaries of his confidentiality; Sacha Pfeiffer (Rachel McAdams), who creates empathetic bonds with her interview subjects, most of whom are victims; and Matt Carrol (Brian d’Arcy James), a no-nonsense champion of facts that must quietly temper his passion when he discovers a “treatment” center for abusive priests set up in his own neighborhood. As the four work their way silently through old newspaper clippings and interviews and testimonies on a trek to discover the truth of the matter, the reality of the situation is amplified by great developments: 1) the realization that the Roman Catholic Church carries heavy influences in nearly all facets of their culture, which offsets their progress; and 2) a simple inquiry into a lone priest’s activities culminates in the discovery of additional offenders – at first four, then 13, and then close to 90, all located within the Boston archdiocese. The movie argues that many of these pieces were obvious, long before Spotlight was asked to start digging. There is an early interview conducted with an anxious abuse survivor named Phil Saviano (Neal Huff), who operates a support group for victims of priest molestation; during key questions about the number of offenders, there is an outburst of significant emotional weight: “I sent you all this information several years ago!” His claims are further echoed during a tense confrontation with a shaky defense attorney (Billy Crudup), who also supplied critical information well before the cases starting piling up on his desk. What happened to all those documents? Some, including editor Ben Bradlee, Jr. (John Slattery), believe they were simply spread too far apart to come together before present day. But is that a legitimate excuse when it comes to comprehending the crimes done against children, especially considering how rampant the problem ran in such a sacred institution for so long? “Spotlight” offers the same penetrating nature of the rough world of journalistic integrity as that of “All the President’s Men” – in itself the benchmark of all movies about the medium – but does not let peripheral institutions off the hook of such a horrific scandal. To Tom McCarthy, the engaged filmmaker at the helm, even mere lawyers and reporters must share some of the blame of what happened to thousands of young children, because the activities had gone on long enough in the shadows to suggest passive acceptance of them in neighboring associations. When Robinson confronts one of his dearest friends who may have insider information about the legal dealings of many of the accused, his proclamation implicates everyone involved: “we all knew something was going on.” But that begs the question of what exactly roused the Globe to dig at the precise moment it did, too. What separated a room of experienced editors, reporters and decision-makers from their new leader, who knew instinctively that a story was there to pursue while others did not? Was it a question of mere outsiders lacking the perception to see through blinders, or did his own Jewish faith displace him from the cultural acceptance of Catholicism in Boston, where it was seen as the predominant reliance of the populace? The personal reflection of the characters is often brief and fragmented, but only because it needs to be; given both the gravity of the scandal and the constant barrage of details flowing through their investigation, there is no time for characters to mourn the loss of their principles or settle into obligatory pathos. The Boston Globe published hundreds of articles in 2002 revealing the full scope of the Church’s part in the cover-up, and the screenplay by McCarthy and Josh Singer plods through the discoveries with the frenetic urgency of a messenger racing against time. Sometimes, it’s almost difficult to keep up with the reveals. Informants from both sides of the aisle come forward in rapid succession – some face-to-face, others more anonymously. An aggressive and unfriendly defense attorney (Stanley Tucci) eagerly dismisses inquiries into his recent class action suit against one priest (perhaps to protect his license) but leaves vague crumbs behind for Mike, who is perceptive enough to see them as conduits to other avenues. Interviews with a defense attorney in some older cases indicate that many of the charges lack legal documentation, because most of them were settled behind closed doors between lawyers on both sides. Searches through old clippings reveal the identities of additional culprits, which then leads to a study of years of published directories of local priests; when a strange pattern of “sick leave” or “unassigned” names emerges in the text, their names are added to a spreadsheet of possible offenders, suggesting a code amongst higher powers. And when that spreadsheet is presented to an insider – and one of Walter’s dear friends – in order to confirm their accuracy, he doesn’t bother to scrutinize the specifics. He circles the entire list. I watched “Spotlight” not in the comfort of a chair but with a tensed posture, leaning forward with my hands clenched as I absorbed the details right along with the characters. Their discoveries piled one after another like alarmingly dangerous confessions, but neither they nor their screenplay are apt to filter the details through sensationalist lenses; the movie is a candid depiction of their investigation, and puts it in a dramatic context that is tempered with a sense of riveting focus. Actors are usually the first resources to ham up the perspective, but Keaton, Ruffalo, McAdams and their dedicated co-stars are working within a method that restrains their performances into something of a subliminal marvel. Ruffalo’s work as the impassioned (and hot-headed) Mike Rezendez is spot-on in emphasizing both the eagerness and the hysteria of the scenario; he wants desperately to come to the truth of the matter, and inevitably must come to a moment where his passion for it nearly undermines his judgement. Keaton also does good work as Spotlight’s more tempered leader, especially in scenes where he must counter the stubborn conviction of evasive sources. And Schreiber, often loud and insistent in his roles, does a remarkable job of restraining himself in a role that requires professional modulation, usually at the cost of appearing distant from what is unfolding around him. History indicates that the truth of the matter would persevere in the face of threat and intimidation, but the church’s inconsolable crimes remain a stain in the lives of millions of Catholics – avid followers, observers, and most significantly a generation of young faces seeking salvation from poverty, who were sexually abused by the same figures that took vows to protect their interests. It would have been one matter to suggest that a Cardinal could have known about the problems without actively stopping them, but it’s something even more sobering to know how widespread the problem was, and how ignorant the establishment remained for so many decades while they were quietly moving around predators from one parish to the next. These are necessary observations to make as we continue to debate the steady decline of the media’s importance over our lives, I think. Facts have become elusive and distorted, but amongst the fiction are those that care simply about the truth, and will put themselves on the line in order to shed light on the problems right underneath our noses. A movie like “Spotlight” is a reminder of that standard, a stirring assessment of the right and wrong of our humanity in the volatile world of a changing newsroom. And twenty years from now, when the ethical code of a new generation of avid journalists is challenged by the allure of misinformation, I suspect it will endure as essential in returning them to the base values of their calling.